Believe it or not, there was a world before Facebook. In the 1950s, this gadget called television exploded throughout American culture. At first, there were black-and-white TVs, and then, toward the end of the decade, there were color TVs in every middle-class living room. As more consumers started watching TV instead of listening to the radio, marketers had to adopt their strategies to the new medium. Successful ad executives and writers took the time to understand how TV fit within American culture. They researched how and why TV became a focal point for families at the end of each day (remember TV dinners?). They researched the ways men watched TV differently from women and which television shows kids preferred on Saturday morning. Only after this research were they able to create successful TV advertisements. They learned to condense their messages to 30 seconds. They created ads with jingles that imitated popular TV themes and effectively placed their products within popular shows. In the same way, today’s successful brands must understand how to best use Facebook to market their brands. There’s a good chance that you’ve heard about how brands like Harley-Davidson and Nutella, as well as thousands of small businesses and nonprofits, are using Facebook to market their products and services. They’re increasing awareness of their brands through highly targeted Facebook Ads. They’re getting to know what their customers really want by having daily conversations with them. They’re launching new products and services with Facebook Pages and custom Facebook applications. They’re increasing new and repeat sales with coupons, group deals, and loyalty programs. They’re enhancing the native experience by using such innovations as Facebook Live and the extensive use of video. Part of the reason why these businesses are successful is that they understand Facebook isn’t just a static website; it’s a way for people to connect and be heard. Word of mouth is the most powerful way to market any business. In fact, many studies have shown that consumers are more likely to make purchase decisions based on recommendations from people they know than from a brand’s marketing materials. Each time a user likes, comments on, or shares content on Facebook, that action spreads to his network of friends. This is how “word of mouth” happens on Facebook. 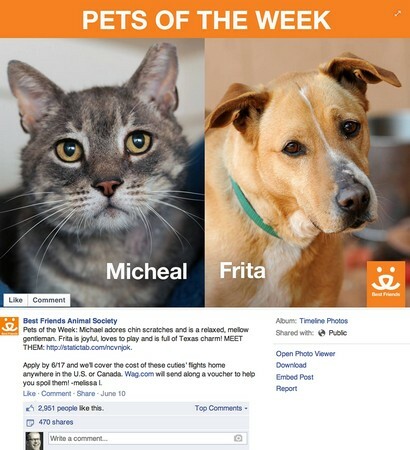 The Best Friends Animal Society benefits from the word-of-mouth marketing that’s generated by 2,951 likes, 57 comments, and 470 shares. According to a Nielsen report in 2015, 83 percent of online users in 60 countries trust brand recommendations from friends and family. And this makes perfect sense. Think about the last time you made a major purchase decision (a car, a TV, or even a contractor). Which influenced you more in that decision: an ad about that product or service, or the experience of a friend who purchased that product or service? The most powerful aspect of Facebook is the deep ties among users. Large portions of friend networks are based on work relationships, family relationships, or other real-life relationships. Some marketers refer to these connections as strong ties, meaning that they go beyond the boundaries of Facebook. Such connections are in contrast to weak ties — online connections that lack stated common interests or goals. Think about it this way: Would you be more influenced by the Facebook friend with whom you went to college or the Facebook friend who sent a friend request simply because she met you at a concert this past weekend? When a Facebook user likes, comments on, or shares a piece of content you publish on your Facebook Page, many of that user’s friends can also see that content. And those friends essentially view those actions as digital word-of-mouth recommendations. Facebook Pages, Groups, and Events: These tools are free for any business and have the very same social features (including News Feeds; comments; and the capability to share links, photos, videos, and updates) that more than 2 billion people use to connect with their friends on Facebook. In other words, Facebook allows businesses to connect with customers in the same way that these customers connect with their friends. This business-is-personal paradigm has helped Facebook transform the way companies market themselves. Facebook Social Plugins for websites: Facebook offers several free plug-ins for websites that allow your website visitors to share your content with their Facebook friends. The Comments plug-in, for example, lets people comment on content on your site by using their Facebook profiles. When they do so, a story is generated in their friends’ News Feeds, exposing their friends to your website content. Facebook Ads: Facebook Ads, which can be purchased on a cost-per-click (CPC) or cost-per-impression (CPM) basis, are increasingly popular because they enable marketers to reach as narrow or as wide an audience as desired, often at a fraction of the cost of other online media outlets, such as Google Ads. And because Facebook members voluntarily provide information about their personal interests and relationships, Facebook has a wealth of information about its members that advertisers can easily tap. Additionally, Facebook partners with a few third-party consumer data companies such as Acxiom and DLX to provide information about purchasing behavior and income. 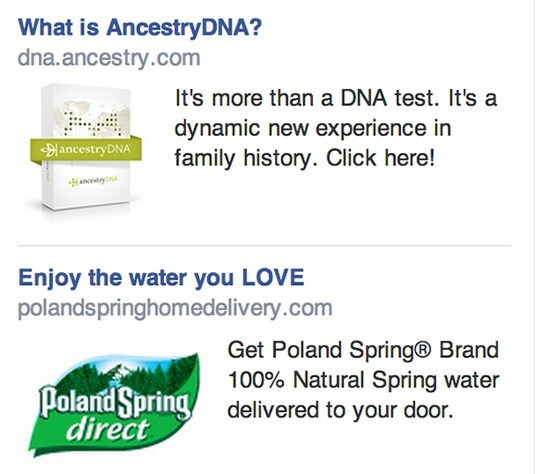 Facebook Ads like these are an extremely cost-effective way to target your exact customer based on a variety of factors.